Mark met his 8th grade mentee for the first time about a year and a half ago. His mentee was struggling with his parent’s ongoing divorce. He needed someone to talk to and someone to support him. The mentee emailed or called the mentor program nearly every day, asking for a mentor. Then Mark answered our call. Mark was a perfect fit. He understood this boy's struggles. They also soon discovered a shared love for soccer, animals, and laughter. They hit it off right away and quickly started spending time outside of school; going to watch soccer games at UCSB, doing homework and playing at the Boys and Girls Club, or just walking Mark’s dog around the neighborhood. Mark focused on providing his mentee with consistent emotional support and understanding while exposing him to new and character building activities to improve his confidence and self-esteem. They became fixtures at nearly every mentor program event, from Zodo’s Bowling to Career Night, and Mark even went above and beyond by coming up with suggestions for future event opportunities to enrich the program. Not only has Mark supported his mentee and the program, he's also made time for his mentee’s younger siblings, including them whenever he could. And then when the siblings were matched up with mentors, he took time to help their new mentors as well! Mark’s consistent support for his mentee, the family, and the program, have made a huge impact on all of us, but the best result is seeing how the painfully shy boy who couldn’t make eye contact, is growing into a confident and accomplished young man. Thank you for all that you do Mark, and congratulations! You are our December mentor of the month! Dani is fourteen years old and has lived with her younger brother and grandma since she was ten. She used to live with her happily married parents until her mom died of cancer five years ago. Soon after her death, Dani's father started drinking, only a few beers after work late at night, but it quickly escalated. His drinking got in the way of him being a present or supportive parent. Dani and her dad were super close, but when her father started drinking more, he became aggressive and argumentative. Dani was depressed about the loss of her mom, upset that her dad basically didn't exist in her life anymore, but even more than that, she really missed their happy family. She tries to be a good sister, but her brother is too young to understand and still idolizes their father. Over the past 3 months, Dani and her friends have started drinking before football games at their friend's house. Dani quickly learned she could drown out her sadness and worries with alcohol and discovered that she loves the feeling of being drunk. She knows drinking is bad and wants to stop but she craves the numbness that being drunk provides. She thinks that so long as she isn't an "angry drunk" like her father, it's okay. As she seeks out opportunities to drink, her grades & friendships start to decline. Her friends start to see that Dani's only fun when she's drinking, depressed and solemn when she isn't, so Dani sometimes finds herself sneaking her dad's tequila from his closet to get a quick buzz and so her friends will want to spend time with her. She wants to stop, but doesn't want her friends to stop hanging out with her. She also doesn't want to feel the pain of knowing her family will never be the same. It's going to be a hard holiday season. 7. Do you think that her friends know something's wrong? What could they do to help her? What would you do if you were Dani's friend? 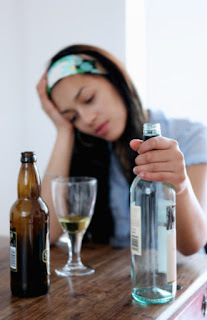 ** Approximately 11 million people suffer from alcohol dependence. 1 in 5 adult Americans lived with an alcoholic relative while growing up. In general, these children are at greater risk for having emotional problems than children whose parents are not alcoholics. Alcoholism runs in families, and children of alcoholics are 4x more likely than other children to become alcoholics themselves. ** Alcohol is more toxic than many other drugs because it damages the entire body, not just the brain. It can cause a huge variety of health problems, including cancer, heart problems, liver disease, and death. Drinking also slows reaction times, so some activities -like driving, cycling and operating machinery – can be deadly while under the influence. ** Alcohol use has also been linked to many social problems, including unwanted sexual activity, domestic violence, and violent crime. The loss of inhibitions caused by alcohol can lead to uncharacteristic aggressive or sexual behavior that can end a relationship or put you in prison. ** Be aware that this topic may hit really close to home with your mentee. If they have a parent or other close family that struggles with this, be careful not to offend your mentee. Their family comes first, even if they sometimes talk badly about them. If they were to say something against their family, it's one thing, but if you do, it could do serious damage to your relationship with your mentee. Be careful to not let your opinions cloud your conversation. ** Talk to your mentee about drinking and its potential consequences, and be honest about the positive or attractive aspects along with the negative. Share your own experiences with alcohol growing up and how that turned out for you. ** Listen to your mentee’s personal experiences with alcohol and try to be understanding of his/her opinion on the matter while sharing how you feel about it. Brainstorm with them the potential positive or negative outcomes of their/a friend’s/a family member’s drinking. ** Educate them about the legal penalties related to underage alcohol use for them and for their older friends or parents who may be facilitating it. ** If you are concerned your mentee has a problem talk to them about it. Let them know they are not alone and you just want to help them get better because you care about them. Do not guilt or shame them about their drinking as this will only make it worse. Try to get them to accept help and contact your case manager for information on treatment options and referrals. ** Go over possible outcomes for the addiction if treated versus not treated. ** These are some very informative website for teenagers who are involved with alcohol or have an alcoholic parent. Labels: alcohol, alcoholism, coping, depression, drinking, drunk, escape, family, friends, peer pressure, What do you think? Peter, a 7th grader, has been really frustrated in his English class. He's already 2 grade levels behind in his reading ability, and his teacher expects him to keep up with the other kids. A lot of days he just gives up and doodles in his notebook instead of reading. There are so many words he doesn't understand and he doesn't want to ask his teacher for help in front of his classmates because they'll make fun of him outside of class. When his teacher starts a class discussion on the chapter they were supposed to have finished last night, he starts to tap his pencil on his desk as he thinks about football practice after school. His teacher calls on him to answer a discussion question, and Peter looks up at her and snidely responds, "What, don't you know the answer?" Do you think that this was an appropriate response for Peter? Why do you think this was his response? What might have been a better answer to the teacher's question, if Peter didn't understand the book and couldn't contribute to the discussion? How might his classmates perceive him after this incident? Positively or negatively? What do you think are the short and long term consequences of his actions? How does talking back affect the relationship between Peter and his teacher? Is there someone else that Peter could talk with about the situation and ask for help to mend the relationship with his teacher? ** Talking back is usually observed when a child or teenager doesn't know how to properly ask for things or to communicate. It is better for authorities to calmly explain to a youngster how to properly communicate, in an appropriate setting and time (and not when a child has just challenged an adult with back-talk). It is important to explain that simply asking respectfully does not necessarily mean they will achieve the outcome they are requesting, and keep in mind that the younger the child or teen the more difficult it can be for them to understand this. The lesson may need repeating...mutliple times. ** Sometimes as the adult witnessing the situation, it is easy to let it go; we already have too much on their plates and it becomes just one more thing to worry about. Sometimes we're reluctant to intervene because we think our mentee will just become more angry. But simply avoiding back talk doesn’t work, because then our protegé won’t learn how to express himself effectively. ** Research shows that if a child is talking back all the time without punishment or firm limits being set, make no mistake, that child is being trained to do it more often. ** Some back talk is normal during adolescence while teenagers are trying to establish their independence. Teenagers often aren’t thinking things through; they’re just beginning to learn how to stand up for themselves, and most of the time they’re not going to do it very well. ** Most importantly, share your experiences with back talk and how you feel about it. Did you talk back when you were their age, why or why not? How did that work out for you? How do you perceive kids/people who talk back now? Also, remember that your mentee is always watching you, so be a good role model whenever you're with them. If someone cuts you off on the road, be careful not to yell. If you encounter a person being rude to you, make sure you think about what you say before you say it. And if you accidentally talk back to someone, be sure to talk it through with your mentee and come up with an alternative conversation that could have been had. ** Pay attention to your mentees opinion about talking back. Is the child disrespectful or verbally abusive to you and others? Is that their only way of getting what they want or are they capable of other ways of communication? ** Analyze your mentee’s self-esteem and comfort. Do they feel powerless or not listened to? Do they seem out of control? Talk with them about why they talk back and try to be understanding. Whatever the reason, once you figure out why they are doing it you can help them problem solve to find another, more effective, method to communicate and reach their goal. Help them consider long term effects of talking back or being respectful. Talking back is often an immediate response that is not well thought out, so considering the consequences before they do it will help them avoid making the same bad choices. ** If you perceive back talk in your mentee, it would be appropriate to help the child/teenager change rude behavior by showing how one’s viewpoint and opinion can be stated in a more respectful and appropriate way. Talk with them about the pros and cons of different communication styles and how not talking-back could be much more effective in reaching their goals at home and in school. Be patient through this process, as your words may need to be repeated several times on various occasions. ** Explain to your mentee that even when two people absolutely don’t agree, there are other options that will work much better than back talk. And sometimes silence, or agreeing to disagree, will keep them from saying or doing something they might regret later. Feel free to role play different situations and responses so when they are in the moment they don’t have to think about it, they have responses planned. ** Talk with your mentee about how he feels when ignoring disciplinary efforts and talking back to authorities. Help them consider the potential consequences of talking back, from just being labeled a “jerk” to getting in serious trouble at home/school or even with the law. Talking back to a police officer can take a simply warning and turn it into an expensive ticket! And if talking back becomes a habit it could negatively impact their work and personal relationships for the rest of their life! Labels: back talk, frustration, reading, rude, school, talking back, teacher, What do you think? Jessica and her mentee have been together for about a year and a half. Through this time, Jessica has seen her mentee change in many positive ways. When they were first matched, her mentee's mother recently passed away, and her father was raising 4 kids on his own. Futhermore, he had to work extra late night hours to support his family. Additionally, Jessica was able to help her mentee improve her grades in math, which was a subject with which her mentee struggled. Her mentee became more engaged and active; she joined the soccer and volleyball teams, and asked Jessica to go and watch the games. Jessica’s mentee also performed in a school play! Although her mentee was her only responsibility, Jessica always made time to talk with her mentee’s other siblings and encourage them to do better in school and reach for their dreams. Jessica unofficially mentored her mentee’s brother until he was matched up with his own mentor to make him feel wanted and included. She is constantly going above and beyond to be a support system for her mentee and her mentee’s family. Because of this amazing commitment, Jessica’s mentee has blossomed into a far more confident and outgoing young lady. Thank you for all that you do for your mentee Jessica, and congratulations! You are the November Mentor of the Month!! !